Includes a free preview of future issues in the collection Last Year of Issue Replica . For more information, please refer to the Satisfaction Guarantee tab below. If you do not wish to preview future issues in the collection, you may purchase the single item using the 'Individual Item Only' tab at right. Designed by John Reich, the Capped Bust Quarter Eagle features a left-facing Miss Liberty wearing a liberty cap, surrounded by thirteen stars. The reverse depicts an eagle with olive branch, arrows, and shield beneath a banner reading "E PLURIBUS UNUM." 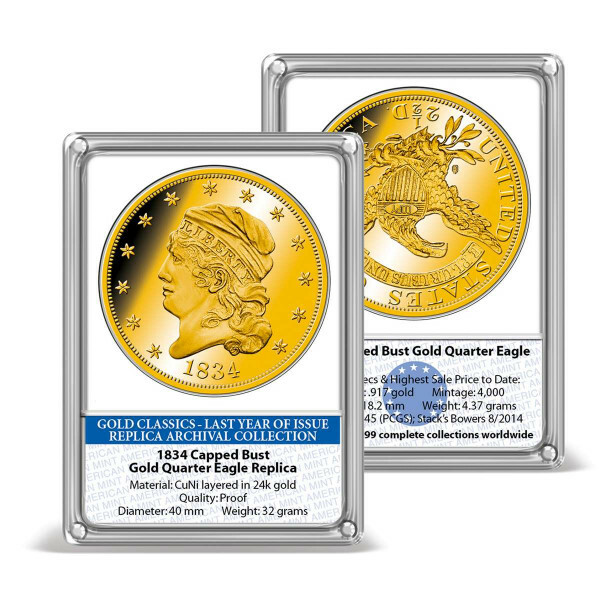 Only 4,000 of the 1834 Capped Bust Quarter Eagles were ever minted, making it a great rarity in any grade and extremely valuable to collectors.Very few of the original coins still exist - specimens in pristine condition sell for as much as $75,000! Available exclusively from American Mint, this 24k gold-layered coin is a brilliant reproduction of the Capped Bust Gold Quarter Eagle from the final year of production. Minted to the highest quality "Proof" standard, it comes in our NumiShield Archival Case to protect it for generations to come. This exquisite replica is the only realistic way to have this extremely rare and incredibly valuable coin in your own collection.